Bryan and Angie get married! Home / All / Bryan and Angie get married! Bryan and and Angie decided to get hitched on July 2, 2010 at charming Faithville village. 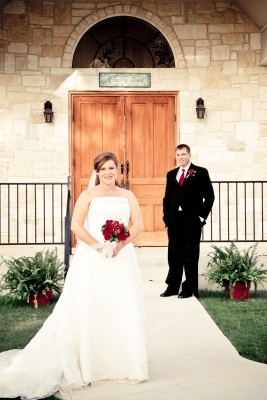 The wedding was held in the early evening at the Amazing Grace Chapel. Angie chose apple red and ivory as her colors. Her bridesmaids wore the latest in fashion with short apple red dresses and beautiful deep red roses. For dinner, the quest were treated to Darlene MaIntosh’s famous brisket and pit-grilled chicken breasts by Amazing Love catering. The food was just fantastic! After dinner the crowd was entertained by DJ Mike Mayorga. He kept that party rocking until the very end and Mike always know what songs get em dancing. Congratulations to Bryan and Angie, may you have many happy years together!